I took a friend down to the Negev desert last week for a tour focused on various environmental topics. We visited sites and discussed issues of CleanTech/Green energy, water usage, desert agriculture, ecology, etc. In addition to being interesting for me, I see it as another niche in which I may work in the future (a number of people expressed an interest in a tour like this once I described it). I designed the tour almost as a “mission,” mixing traditional site visits, meeting with experts and tours of business sites. I’ll start by saying that due to a slight logistical problem, we got a later start than I had originally planned, and so I ended up needing to cut out one stop, but I will describe it in here as well, so you get an idea of the type of sites that would be included in such an itinerary. I’ll also discuss some of the topics we discussed during our drives — things that were related but not directly connected to any specific site we saw. We started the day in Rotem Industrial Park outside of Dimona. There is very tight security there, due to it being situated on land next to Israel’s nuclear reactor. The park is home to (among other things) BrightSource Energy’s Solar Energy Development Center, a test facility that does not actually produce any electricity. 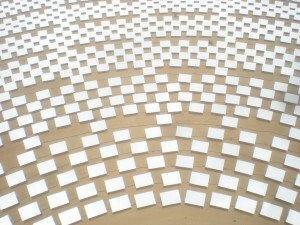 Rather, it is BrightSource’s facility for testing new technologies and materials. There we received a private tour, and learned about the solar thermal technology used, as well as some of the new ideas they are testing. One was a pair of heliostats (mirrors used to focus direct sun rays on a single spot) that are mounted together and aimed collectively, thus saving some power. Around the area, we discussed the history of the Dimona nuclear plant, the new ideas in wind power that Leviathan Energy is developing (they also had some test turbines at Rotem), and other alternative energy technologies being developed by Israeli companies, such as piezoelectric power beneath highways. We also spoke of some of the other ways solar energy is used in Israel, including private solar water heaters and passive solar heating via green home design. 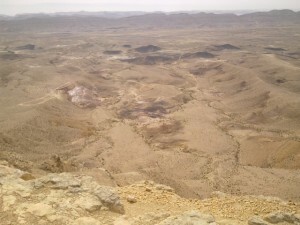 From Rotem, we drove to Sde Boker, via the Large Makhtesh. Though we were not able to stop in the makhtesh, it offered unique views and an opportunity to discuss the geomorphology of the area. A makhtesh (the official geological term, by the way, rather than the inaccurate term “crater”) is a unique geological formation in this region, and we spoke of how they are formed and some of the different types of things you can see inside the makhtesh. In Sde Boker, our first stop was a meeting with Dr. Yoram Ayal, a professor of desert ecology at Ben Gurion University’s campus there. We spoke to him specifically about the Avdat (Evenari) Experimental farm that we were to visit later in the day. Though he did not develop the farm, he now oversees it. We also spoke to him about general water usage issues in Israel, getting his unique perspective on the problems and potential solutions. The one thing that we had planned, but that we had to cut out due to our late start was a visit to a different solar energy facility, and a meeting with an expert there. Due to the overlap, I felt that was the best thing for us to cut out, but otherwise we would have also visited the Ben Gurion National Solar Energy Center at Sde Boker. 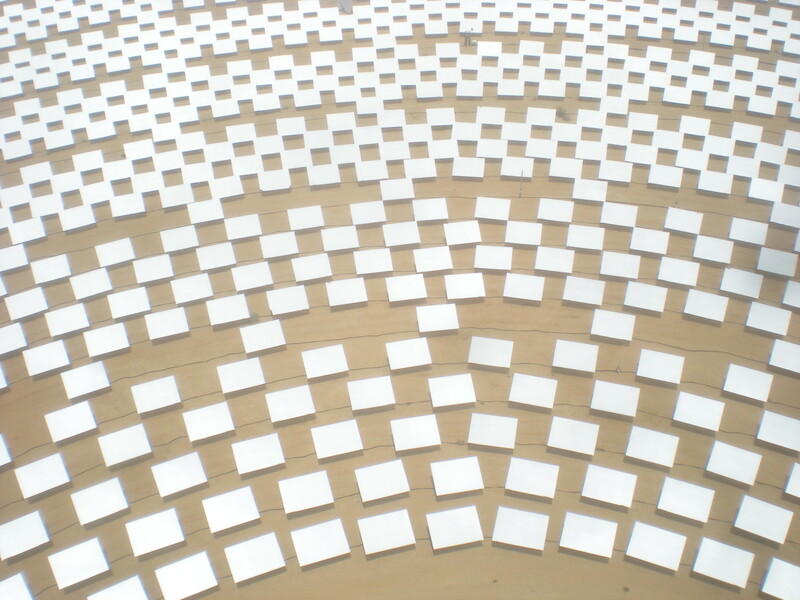 There they have an array of heliostats for a different solar technology, concentrated photovoltaic energy, and they also conduct research on many other solar energy technologies. From Sde Boker, we drove down to the experimental farm that was created by the late Dr. Michael Evenari at the foot of the ancient Nabatean city of Avdat. At this farm, Evenari rebuilt fields and runoff irrigation systems that had originally been used by the Nabateans, allowing them to grow crops that require a lot of water in a desert area that gets only around 150 mm of rainfall each year. The technology worked, and over the years, the Evenari farm produced crops as varied as barley, almonds, pistachios, apricots, grapes and peaches. And though the system wasn’t that cost effective for countries such as ours, the methods have been applied in developing countries with large desert areas, such as Kenya. The farm is now no longer being actively farmed, and instead serves as an area for desert ecology research, but the bulk of the installation still exists and works passively for the trees that remain there. 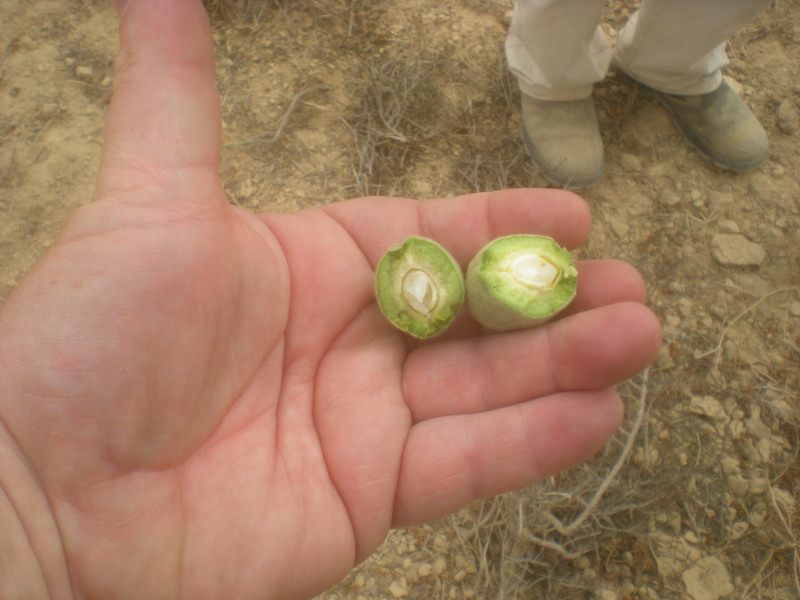 A fresh almond I picked at the Evenari Experimental farm in Avdat, grown using ancient Nabatean irrigation methods. On our way back northward, we stopped to see a hidden Nabatean water cistern in Nahal Havarim. It and others like it collected runoff water and allowed the Nabateans to travel and survive in a desert where no one else could figure out how to do so. Then as we drove to our final stop of the day, we spoke about desert agriculture in general, focusing on what is necessary and what types of technologies Israel has developed to meet this challenge. Our final stop of the day was at Kibbutz Revivim (link to Hebrew website), a kibbutz that is famous for its desert agriculture. They grow acres of olive trees using the brackish water that is in the Negev’s sizable underground aquifers. I told my friend about the history of Revivim, one of the earliest Negev settlements, and its importance in Israel’s history. It virtually defines desert agriculture, and I must say that despite its location, it is one of the lushest and most beautiful kibbutzim I have ever been on. Finally, I explained how Revivim and its desert-grown gladiolas are largely responsible for Israel’s possession of the Negev in the first place, and thus its place in allowing us to have a day such as we did. On our way from Revivim to Beersheva, where I dropped my friend off, I told her about Israel’s leading place in the field of wastewater recycling and reuse. It is a fascinating segment of Israel’s Green record. At the same time, however, I looked at the flip side. I briefly told her the story of Ramat Hovav, a chemical waste dump south of Beersheva, that is the site of one of Israel’s blemishes in this arena. All in all it was a long, interesting and fun day, and I look forward to exposing this subject to more tourists in the future! I’ve been to Israel three times but I never visited the Negev. Your review sounds interesting.